The climate of Easter Island (Rapa Nui) is subtropical, warm and humid in summer and mild in winter, since the average daily temperature ranges from 23/24 °C (74/75 °F) in the period from January to March, to 18.5 °C (65 °F) in the period from July to September (the island is situated in the Southern Hemisphere, where the seasons are reversed in comparison with those in Europe or North America). 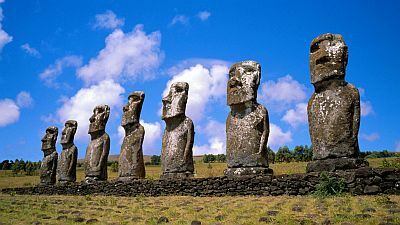 Easter Island is located 3,600 kilometers (2,200 miles) west of Chile, lost in the Pacific Ocean, a little to the south of the Tropic of Capricorn, and it's famous for the moai, the large stone statues which are a sort of watchmen of the island. The daily temperature range is small because of the influence of the ocean. Although the maximum temperatures are usually not too high, and on average are around 27 °C (81 °F) in the warmest period that goes from January to March, they can sometimes exceed 30 °C (86 °F) all year round, while at times they can reach 35 °C (95 °F) from January to April. On the contrary, during winter, sometimes the night temperature may drop slightly below 10 °C (50 °F) from June to August. The rainfall on Easter Island is quite abundant, around 1,050 millimeters (42 inches) per year, and it's well distributed throughout the year, though more abundant in April and May. Sometimes, periods of bad weather with heavy rains may occur during the winter, from June to August. On Easter Island, the wind blows frequently throughout the year. The amount of sunshine is not so good from April to September, while it is good in summer, from December to March. The island is located outside the area in which tropical cyclones form. The sea is warm enough for swimming from December to April, while it becomes quite cool, around 20 °C (68 °F), in the Southern Hemisphere winter. Notwithstanding the fact that you can go to Easter Island all year round because it has a good climate, the best time is the austral summer, from December to March, since it is the warmest and sunniest time of the year. The heat is usually bearable, also because it's tempered by sea breezes. There is a moderate amount of showers in the afternoon or evening, which are usually short-lived, but sometimes can be violent. In winter (June to August): bring clothes for spring and autumn, a sweatshirt or sweater and a jacket for the evening; a raincoat or umbrella. In summer (December to February): bring light clothing, a sweatshirt for the evening, an umbrella or a light raincoat.